All over the world, language barriers are limiting the ability of refugees and immigrants to seek help, and aid workers to provide it. Tarjimly is a new service that connects people who speak one language but need to speak in another, with a person who speaks both — in just a couple minutes. They’re part of Y Combinator’s latest batch and are now officially launched after a year building the product. The company’s co-founders, Aziz Alghunaim and Atif Javed, told me how the company emerged from a side project built while they worked at Palantir and Oracle, respectively. It was a year ago, when the tide of refugees streaming out of the Middle East was growing. The basic problem is simply that there aren’t enough translators to go around, and the work they do can’t be delayed by the days or weeks it might take to find one; sometimes, as in cases where there’s imminent danger or critical logistical issues, it can’t be delayed by even an hour. You can’t stock every aid site or headquarters with dozens of interpreters, some of whom may only work a few hours a week. And relying on the local community (which some aid workers do) isn’t a good option either, since the populations are by definition the ones who need help, and anyway may not be around for long. That’s where Tarjimly comes in. Right now Tarjimly is only on Facebook Messenger, but an independent, multi-platform app is on the way that will allow cross-platform chats, between Messenger or WhatsApp and SMS, for instance. 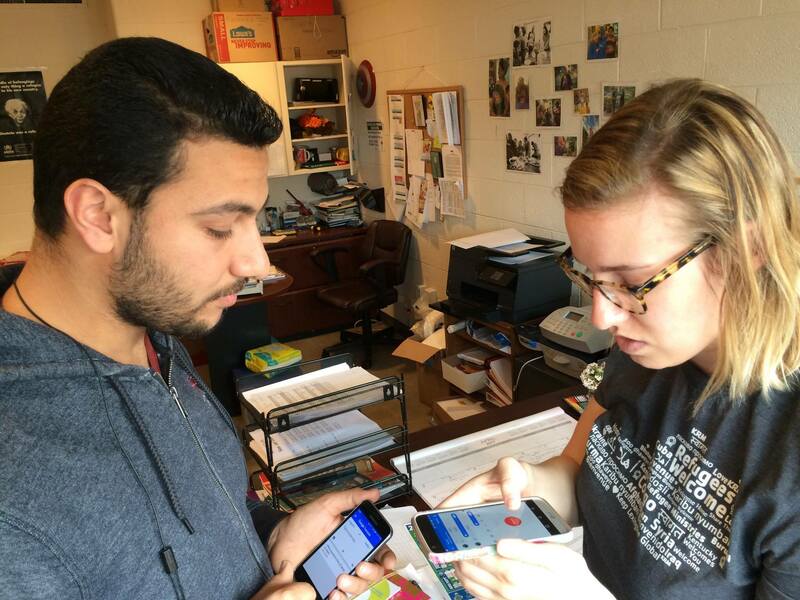 Using the chat interface, an aid provider or refugee indicates their own language and the language of the person with whom they need to speak. Tarjimly scours its database of volunteers and, using a bit of machine learning (naturally), it finds the users most likely to respond quickly. When it finds one, it connects the two through the chat interface; to make things easy and anonymous, the messages are relayed through Tarjimly’s servers, which both obscure the users’ IDs and allow cross-platform chats. 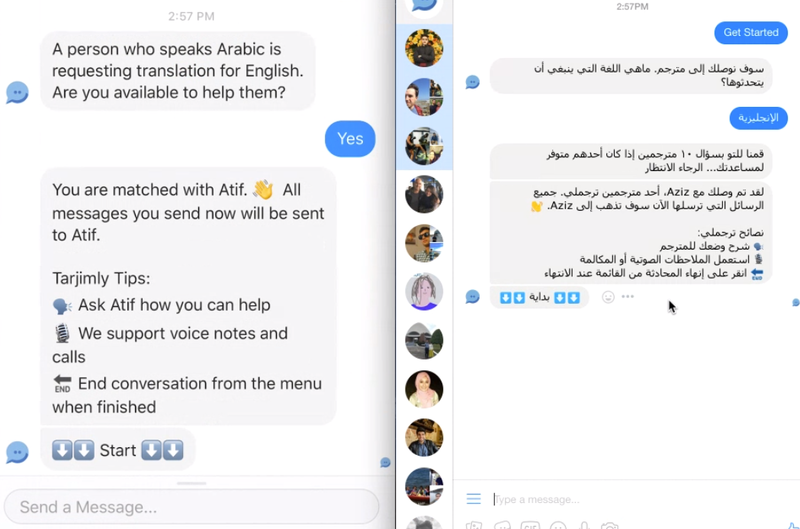 On the right, the requesting user’s screen (in Arabic), and on the left, the volunteer’s screen. Once connected, the user can enter text or send voice messages; the volunteer just translates them and sends them back for the user to share with their interlocutor how they please. Audio and video chat can be requested, and documents and images can also be sent to the translators in case a quick consultation is necessary before signing something or waiting in a line. The idea isn’t to guide people through major processes like immigration — dedicated interpreters are still needed for long interviews, technical language and so on — but to handle time-sensitive matters like distribution of food and water or explaining an event or injury. Right now the service finds a match in an average of 90 seconds, and these acts of “micro-volunteering” usually only last a few minutes. Sixteen languages are currently supported (plus dialect variations), with a focus on those spoken by major refugee populations: English, Arabic, Persian, Pashto, Urdu, Spanish, French, Greek, Italian, Bengali, Turkish, Somali, German, Portuguese, Kurdish and Burmese. The more than 2,500 translators on the service have already helped over 1,000 refugees in the time leading up to launch. As for the possibility of bad translations, perhaps even intentional ones, Tarjimly does let users rate their experience, but Javed noted in a follow-up email that “We’re cultivating a strong community on FB where translators share feedback, ideas, and call out bad actors. One easy solution we have in mind is to use translators to QA each other.” But it hasn’t been a problem so far, he added. Tarjimly’s position as a nonprofit is a deliberate one; the company aims to fund the service through grants and donations in order to keep it free for refugees — a population that, while sizable and motivated, isn’t exactly ethical to monetize directly. They consider the service’s ability to scale quickly for low cost a major asset. Tarjimly co-founders Aziz Alghunaim (left) and Atif Javed (right). Taking part in Y Combinator should help there; both founders were enthusiastic about the resources and feedback they’d already received from the accelerator. The next step, apart from getting the service out there to attract more users and volunteers, is to continue working with aid organizations and people on the ground. The team has already spent a good deal of time on this side of things, but will soon depart for a two-week trip to Greece to chat with and observe refugees and aid workers there. Millions of people could use something like this, so let’s hope it catches on. If you speak multiple languages, consider signing up as a volunteer; a few minutes of your time could make a serious difference to someone in need of immediate help.